It is cute and kind of true to the picture, but it is a lot bigger than I thought it would be. I ordered based on measurements and it fits like an off the shoulder top. I’ll have to tuck it in so it isn’t billowing at the bottom, but at least the cats are cute. Lovely silky soft material. Feel great wearing it. Fits well. Only negative is its slightly cropped in length. Q:how close to us sizes are your products? i ordered shorts but i dont know if they will fit me, i dont understand centimeters and your definition of sizes. 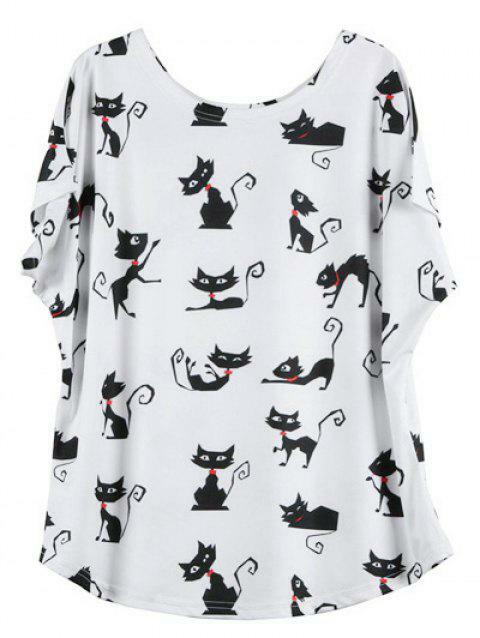 Q:Hello Friends - Yesterday I shared on Facebook this Loose Fitting Cartoon Cat Print T- Shirt. Sent it to my friends and they sent it to their friends. You can look on my Facebook. My name in Facebook is the same: Hildi Balint-Hayes. Your ad promised that if someone shares an item, will get the item free. What has to be done next? Q:I wear a 12-14. This apparently would not be large enough for me?